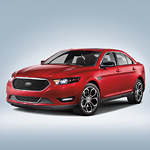 Drive the Stylish Ford Taurus | Beaman Ford Inc.
Do you need a spacious sedan? The Ford Taurus is a popular full-size sedan. The sedan is perfect for singles and large families. If you need a vehicle for weekly grocery trips or weekend family vacations, this sedan may exceed your expectations. The great craftsmanship will make your daily commute more enjoyable. At Beaman Ford Inc., we know you want a powerful engine and a quiet cabin. The sedan has insulation in the cabin and in the engine compartment. The high-quality insulation will minimize external noises when you want quietness or a conversation with your passengers. Whether you are driving in the summer or the winter in Dickson, the temperature should always be perfect in your vehicle. You should not have to drive with sweaty hands or cold fingers. The stylish Ford Taurus has dual-zone climate control. When you need more luxury, you can make the front seats cooler or warmer.